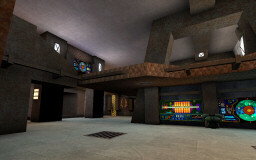 Map Description The Igneous Labs corporation once developed mining technology for Liandri. Now they supply the company with advanced weapons technologies-- and in this case, a deathmatch arena. Located in a volcanic fissure on the surface of the fringe planet M1703, the Igneous Labs macro-thermal research facility has been shut down in favor of a new facility on the planet "Lava Giant". However, this does not mean the end of action for the closed facility. 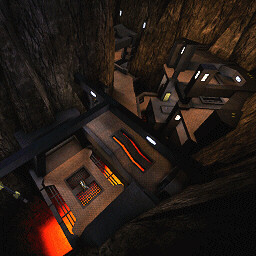 It is now home to deathmatch as heated as the molten rock below. Nicknamed "Red Fate" for the long fall to the glowing red lava, the arena welcomes competitors with a simple message, "A red fate awaits you." I though it was Redfist.
. I agree that low texture variety is probably the weak point. My initial vision for the map was smaller, so I had not planned for many different texture themes.
. Good point on the lava damage also. I guess I had gotten too used to the map and didn't fall in that often, although the more moderate damage does make it possible to save yourself if the translocator is enabled.
. I didn't include any lifts because bots tend to get goofy with them, though I could have included some decorative moving elements... oh well, next time I guess.
. Yeah, I sort of screwed myself with the overused theme. Extras like the company logo help set if off, but for my next map, I think I'll go with a more original theme from the start.
. I put the shield belt in a central, highly visible area so that anyone taking it opens themselves up to attacks from many angles. Maybe the gameplay with it isn't working out quite the way I intended. Putting it over the lava is a good idea too.
. I do like this theme and these textures. The only problem is that everyone else used them first. :) Next time I might go all out and make more of my own textures.
. Would you believe I started this as a 1on1 map? 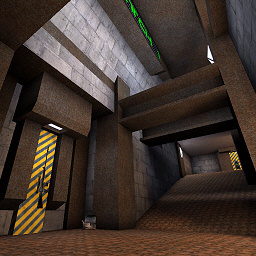 This map is pretty nice, some of the textures are alittle bland, but overall its a good map, author made it well and it seems to run good on my older pc, only real problem is its an over done theme and is basically the same feel as most industrial maps, this one is just above a lava pit. BTW nice touch with the company logo. EDIT: Dont feel too bad, there are only so many themes and industrial ones are just the most common, probablly because most of the textures work good for those kinds of maps. You did a nice job putting your map together, it runs good, no major bugs I found, and has a good layout for DM. Cant wait to see something different from you. I agree with you that not enough textures were used. It could've made the place a little more active. I think that the shield belt was too much out in the open and should be replaced with body armor. The shield belt could be out on a small ledge or something over the lava where you need the jump boots to get to. Thats just my idea though. The company name and the globe are cool also. The layout of this map is busy and cramped. Texture and looks owe some to Deus Ex. Promising job but needs work; in my opinion.